I’ve mentioned before that this is something I feel really passionate about. I found an interesting article the other day about photoshopping magazines that really kind of infuriated me. 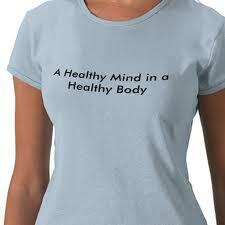 The media plays a huge role in the way young girls view themselves, not to mention women and moms. If you have a spare 5 minutes, it is an interesting read. I occasionally read a mommy blog called Power of Moms and they have recently posted 2 articles on this topic that shed light on how to develop and maintain a healthy body image, especially after having children (we’ve all been there, right?). I think the author really puts it pretty beautifully. You can find part 1 here and part 2 here. Some readers have some great ideas. I don’t have a daughter, but if I ever do, I’ll hopefully have all the tools to make her confident woman who values so much more than just the shape and size of her body. As promised, here is the easiest and fastest way to use up those last 5 or 6 corn tortillas that are always left over from enchiladas. Make them into tortilla chips. 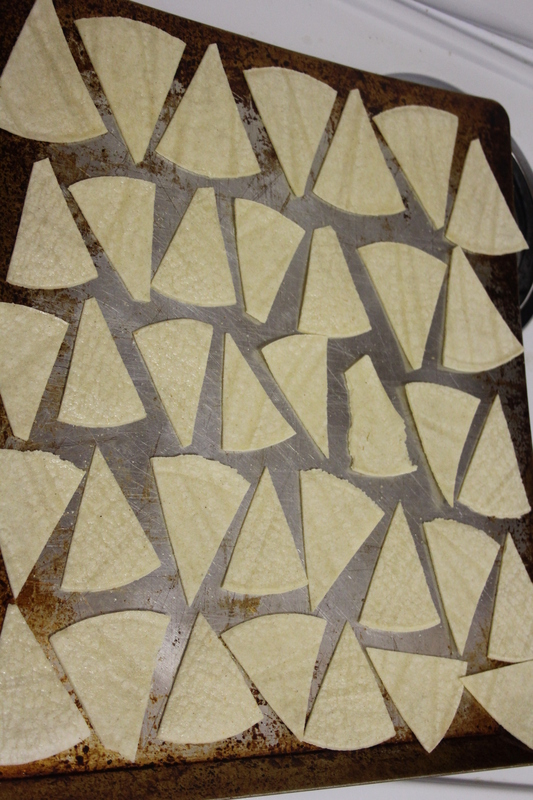 Just stack them up, cut them into halves, then quarters, then eighths to make pretty little triangles. Lay them on a cookie sheet and spray with nonstick spray. Sprinkle with salt. Bake them at 375 degrees for 5 minutes. Then flip them all over, spray and salt them, and cook them for 5 more minutes. Voila! Yummy, thick, and crunchy chips just begging to be dipped in something delicious. The other night I made my favorite rice and bean dish and realized I didn’t have any tortillas to put them in. 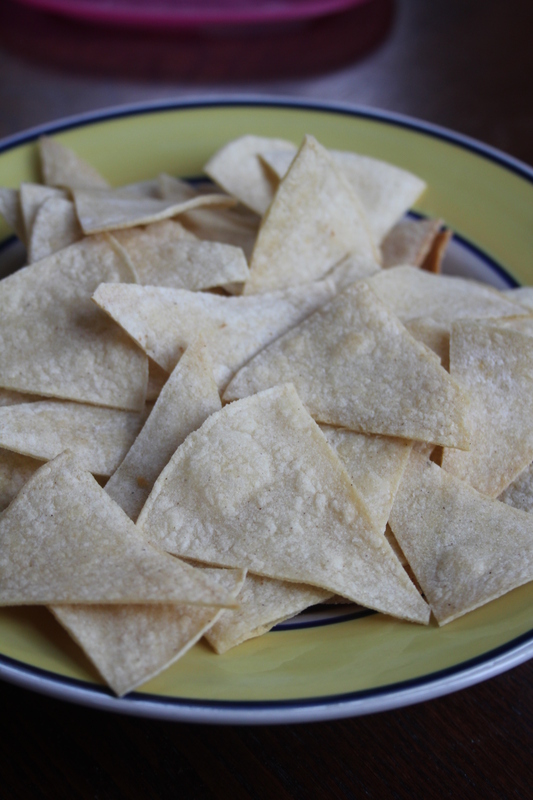 I made some quick homemade chips to solve that problem (post coming soon). 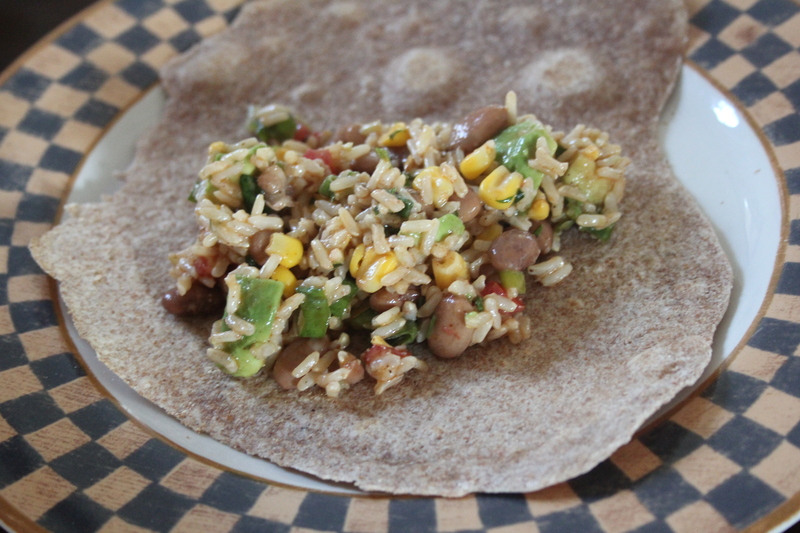 The next night we had to finish eating the ginormous batch of rice and beans, so I decided to whip up some tortillas. It was actually pretty simple. They are not nearly as pretty as the website I got the recipe from, but not bad for a first attempt. Mix the flour, salt, and baking powder with a whisk. Add the canola oil and mix with your fingers until all the oil is incorporated and the mixture looks like fine crumbs. Add 1 cup of hot water and mix until a ball is formed. Cover with plastic wrap and let the dough rest for about 30 minutes. .
Divide the dough into 12 balls and roll out one at a time on a floured surface. Brush off excess flour. Cook on a hot, ungreased griddle over medium-high heat. 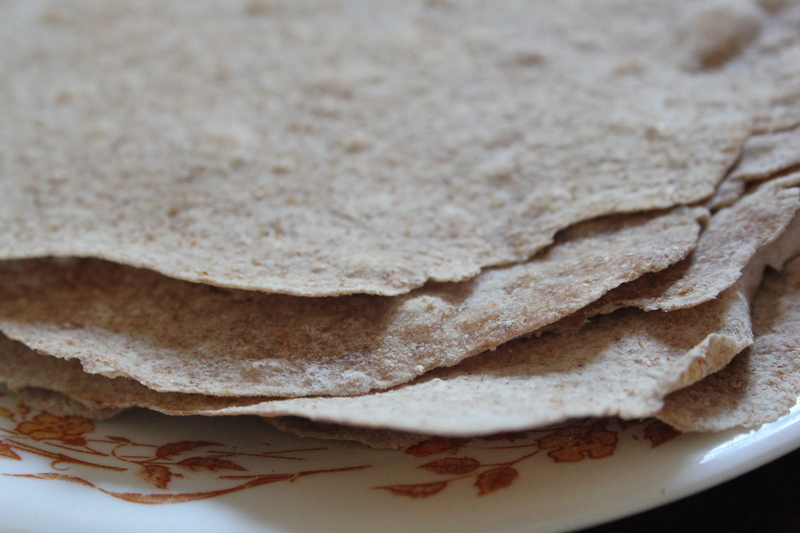 Turn the tortilla when brown blisters form on the first side. Stack the tortillas and serve warm. Warning: This is not a healthy recipe, but it IS better than a cake mix from a box that has 1,000 ingredients. At least you will be able to pronounce and recognize all the ingredients in this recipe, and it will taste better too. The Mr. celebrated another birthday this week. Time is sure flying by us. We still feel like kids, but it’s catching up to us that w0w- we are almost middle aged now! He requested I make this cake, which has been my go-to cake for many years. We haven’t had it since I was pregnant with Cooper so I was excited to eat some! Preheat oven to 350 degrees and prepare two 9-inch round baking pans, lining with parchment. -On one layer of cake, place cookie halves that have been separated into the bottom of one pan, cream side up. Pour batter very carefully into prepared pans. Cool 10 minutes; remove from pans and place onto wire racks. Remove parchment and cool completely. Stir melted butter into cocoa. In the bowl of an electric mixer, whip the cream, sugar and vanilla until stiff. Gently fold in the cookie crumbs. Scoop the mixture into a piping bag (or gallon sized ziploc bag). 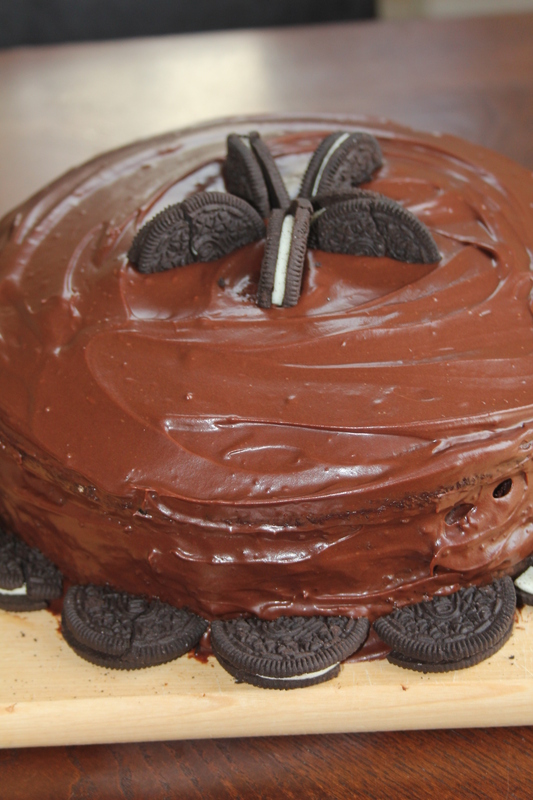 When cake is completely cooled, make icing dam around the top edge of the layer of cake that has oreos baked into it. Fill icing dam with a layer of cream filling. Place other cake layer on top, and frost with chocolate frosting. 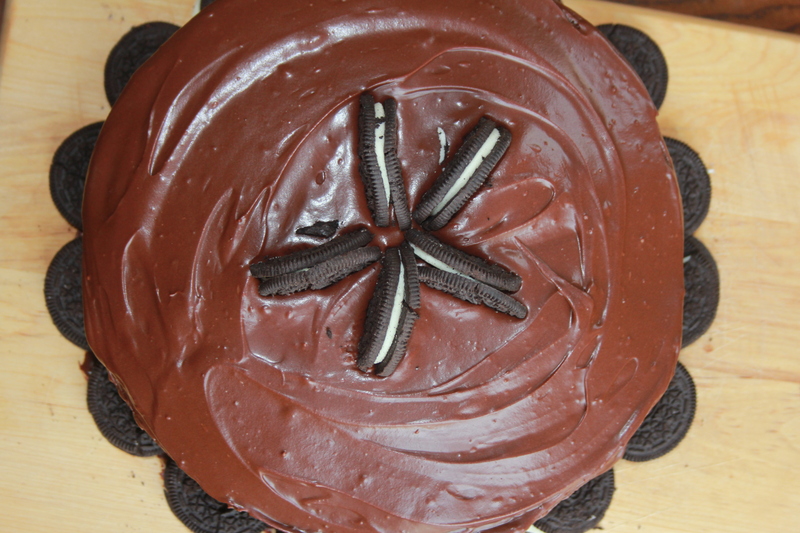 Place oreo halves around bottom edge and top of cake. Serve or store in refrigerator. Me: 1 slice and I savored every bite. 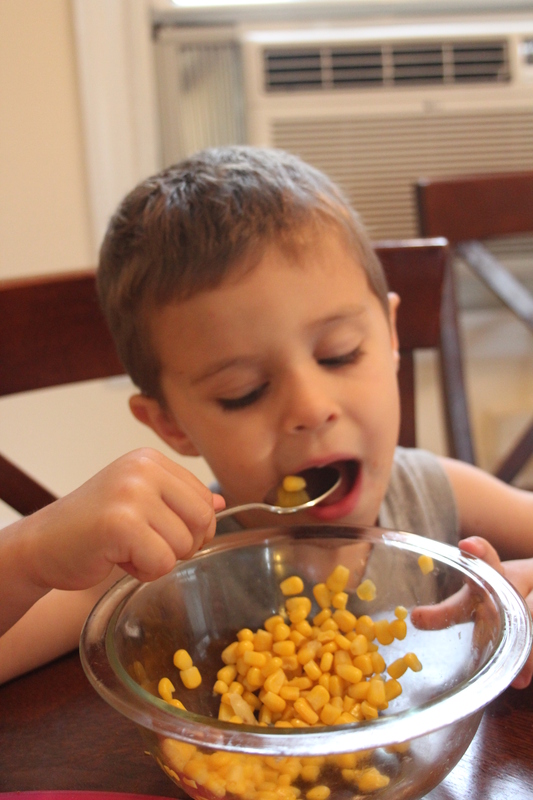 The Wild One: Gobbled it up and asked for more. Denied. Tornado: Ate it quickly and then rubbed some in his hair. Awesome. We are all filled with this yummy chocolate goodness and will dream about it tonight! A great perk of a BBQ (and maybe the motivation to having one) is that you really don’t have to “cook” right? So some people might think it is silly to make your own buns. 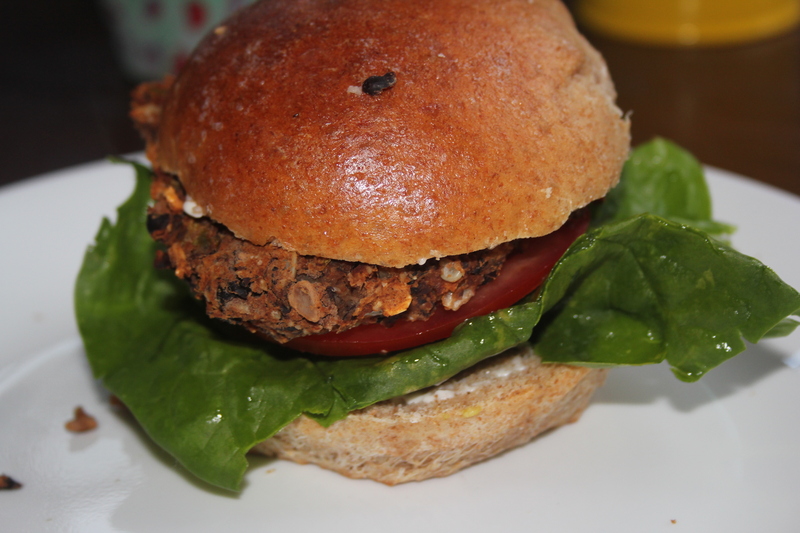 However, the other night I made veggie burgers and I didn’t have any buns so I just whipped some up from scratch. It was really pretty easy and simple, so I didn’t feel like I was stuck in the kitchen forever. Plus if you make extra, you can freeze them until you next time you need them. Combine the warm water and yeast. Let sit for 5 minutes. Add the honey, melted butter, and egg. Beat until smooth. Add 2 cups of flour. Beat until smooth. Add salt and remaining flour until you get a kneadable dough. Knead for 6 minutes. Cover dough and let it rest for 10 minutes. Divide dough into 8 pieces and shape into buns. Place buns on a greased/parchment paper lined cookie sheet. Flatten. Let buns rise until doubled, usually about an hour. If desired, brush with beaten egg white and sprinkle with Italian seasoning, poppy seeds, or sesame seeds. Hi all. Hope you had a great weekend. We had this dinner a few nights ago (just over pasta sans shrimp) and it was d-licious. I didn’t even let it simmer for hours like you are supposed to. I’m sure that makes it taste even better. Here’s the recipe. The whole family loved it! 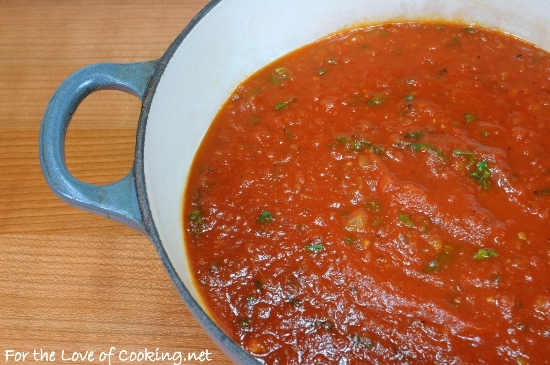 It makes me want to do this every time instead of buying bottled spaghetti sauce. Sometimes those $1.50 a jar things are pretty hard to pass up. But now at least I have a good alternative.